Perhaps it has something to do with the extremely long winter, here in the UK this year, but recently, Little Chap has developed an insatiable appetite for watching films. We haven’t felt much like venturing outside our cosy living room, much less outdoors and there are only so many times a day you can indulge a four-year old his make-believe games, or he your game of Snakes and Ladders! So “Family Film Time” has evolved of many a weekend, when we make a bowl of popcorn and snuggle on the sofa to visit strange lands and encounter great adventures. Together. As a family. This is the ultimate girls’ own adventure story. Young Mulan’s destiny appears to be limited by her parents to a good marriage but after her interview with the village matchmaker does not quite go to plan, Mulan questions her place in the world. Then the Hun invade China and Mulan’s lame father is called to go to war for the Emperor. Mulan takes her chance to save her father and bring honour to her family her own way. At a time when women could be executed for impersonating a man, she disguises herself in her father’s armour and joins up in his place. Unknown to Mulan, her family call upon their ancestors to bring her home and they assign a disgraced dragon to the task. Eddie Murphy is hilarious as the hapless dragon who soon discovers this lady is not to be deterred! Link to official trailer here. Excellent! Despite it being a girls’ own adventure, our Little Chap loved it and wanted to watch it again the following week. There was a little violence, though mild, which threw up some questions for him, but nothing we couldn’t handle. This evening, it was all about the ancestors. What or who were they? Why did they live in jars at the bottom of the garden and what were they talking about? The other night, having spent all day humming the song about the matchmaker visit, Little Chap wanted to know why Mulan had to go and visit her. We’ve seen it several times now and once or twice he’s covered his ears when the Hun appears (he does have a particularly evil demeanour! ), but he’s not been deterred from watching it and the film certainly doesn’t seem to have sparked any nightmares. At the end of the day, he’s snoring happily…! The film has enough plot, humour and action to keep the grown-ups interested too. Eddie Murphy brings his usual brand of humour to the part of Mushu, the hapless dragon. Mulan herself is a likeable heroine and the film has many attractive supporting characters. Worth a mention are Mulan’s well meaning but meddling grandmother and the matchmaker (Miriam Margolyes). A classic Disney story – girl meets adversity, digs deep, finds courage and goes on to achieve great glory and honour and self belief, good things happen to her. What’s not to like? I liked that this was just “Hint of classic Cinderella”, rather than cut and dried. Happy endings, or at least some implied happy ever after is still fairly essential when your four year old is watching! A Classic Disney plot with some lovely musical numbers interwoven seamlessly with the storyline, humour, romance and adventure. Genuinely something for everyone. 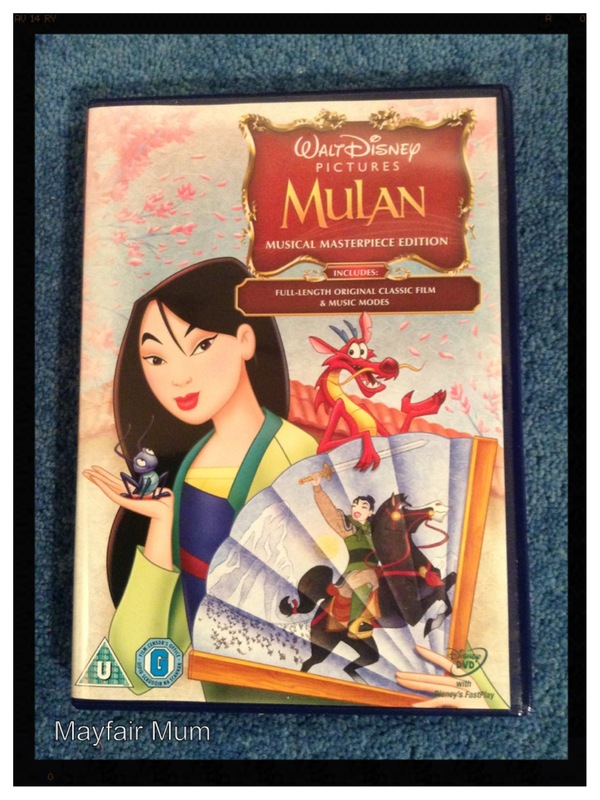 We bought Mulan on special offer at Sainsbury (two for £15). If you would like to buy a copy now, it is also available from Amazon (see link below). Disclosure: If you choose to buy a copy of the DVD from this link to Amazon, Mayfair Mum will benefit from a small affiliate percentage. This entry was posted in Little Chap Sees, Reviews & Recommendations and tagged adventure, comedy, courage, Donny Osmond, Eddie Murphy, film, honour, kids, Miriam Margolyes, Mulan, musical, Walt Disney by Mayfair Mum. Bookmark the permalink.